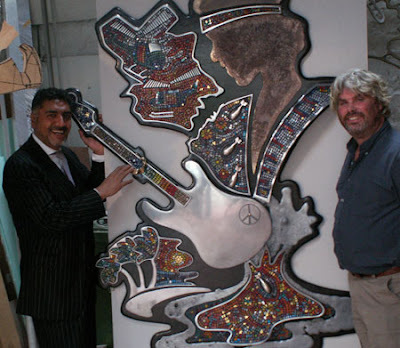 Entrepreneur James Caan and Guy Portelli with Jimi Hendrix in aluminium, bronze and mosaic. Guy Portelli at work. Guy is a council member of the Royal Society of British Artists. Sculptor Guy Portelli's Pop Icons exhibition at The Mall Galleries, London, opens to the public on Thursday 25th June 2009. Partly funded by Theo Paphitis, James Caan and Peter Jones, three entrepreneurs from BBC TV's popular Dragons Den, this is the largest exhibition on the theme of the Pop Icon ever staged in the UK. Here's part of the invite to the private view (yes that's my name amongst an illustrious bunch of exhibitors - I've been asked to exhibit three limited edition photographs of the beautiful, sultry Sade) - and below is an interview I recently conducted with Guy about his work. Above: Guy's pitch on Dragon's Den. Jude Calvert-Toulmin: What was the most amusing thing to happen during your appearance on Dragons Den? Guy Portelli: When I realised that I was standing in front of these wealthy and high powered/high profile people and I had to choose what to do...quite amusing! Jude Calvert-Toulmin: Were you nervous? Jude Calvert-Toulmin: Have you seen Paul Whitehouse and Harry Enfield's spoof of Dragons' Den for Comic Relief? What did you think of it? Guy Portelli: Yes we saw it - excellent takeoff of the characters and their mannerisms - good entertainment! Jude Calvert-Toulmin: Do you listen to music whilst you work? Jude Calvert-Toulmin: Do you keep abreast of current new music or like most of the rest of us listen to old favourites from your youth? Jude Calvert-Toulmin: Do you have assistants in your workshop studio? Guy Portelli: Yes - usually two - last week up to five! Jude Calvert-Toulmin: Do you prefer to work alone? Guy Portelli: Yes for the creative side, no for the production. Jude Calvert-Toulmin: I notice you use Swarovski crystals in several of your pieces - Material Girl & Frank Sinatra, to name a few. I am crazy about Swarovski. Have you seen the de Art crystals in this season's new Swarovski range? They're asymetrical. What do you think of them? Guy Portelli: I have seen a few - their Gt Marlborough St Shop is "bling" heaven! 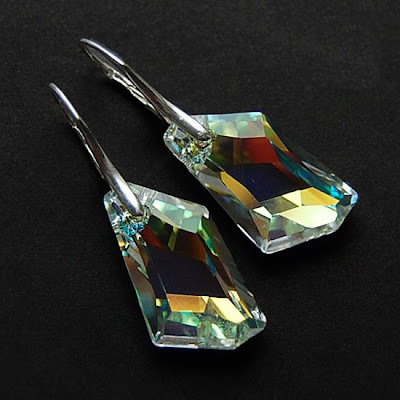 Jude Calvert-Toulmin: What do you think about Swarovski generally? Guy Portelli: Expensive but good. 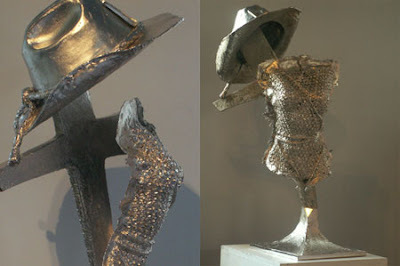 Guy Portelli: I have done in the past but now using cast aluminium with nickel or gold plating. Jude Calvert-Toulmin: What is your favourite material to work with and why? 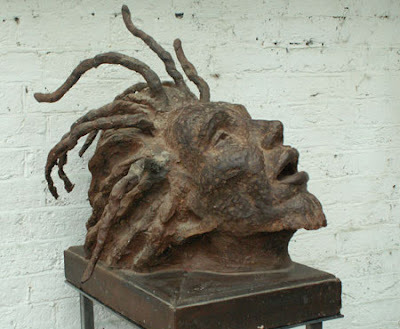 Guy Portelli: Bronze remains the classic material for sculpture and a number of my Pop Icons pieces are bronze. Jude Calvert-Toulmin: Have you ever used ungrouted smalti in your mosaics or have you mainly used Italian glass tessarae? Would you like to use smalti in the future if you haven't used them so far? Guy Portelli: Yes I have used it but find it hard to grout - but it produces some interesting effects. 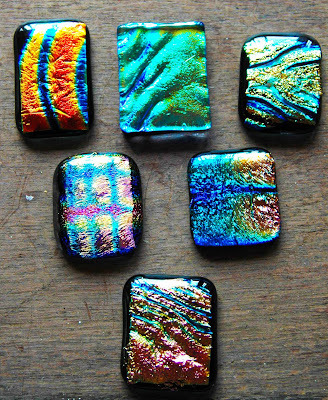 Jude Calvert-Toulmin: How do you feel about dichroic glass? Guy Portelli: I have not used it so far...and havent researched it so can't really comment. 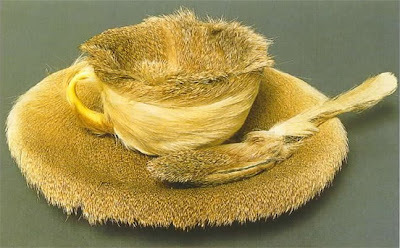 Dada Movement: by Meret Oppenheim, constructed with fur from a Chinese gazelle. Oppenheim is also often credited with coining the phrase " Nobody will give you freedom, you have to take it"
Jude Calvert-Toulmin: How important is the Dada movement as an influence in your work? 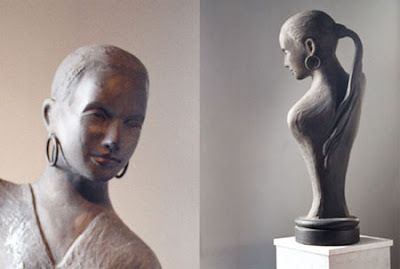 Guy Portelli: I dip in and out of every art"ism" to put together combinations of images and styles - no one movement is favourite - but I do like Italian sculpture of the 50s. Jude Calvert-Toulmin: Me too, especially Murano glass! Jude Calvert-Toulmin: Do you mentally construct an entire piece before physically assembling it? How much of the creative process occurs during the actual making of the piece? Guy Portelli: I usually have the first few stages resolved at the outset but rely on watching the work unfold to give the last few magical elements. 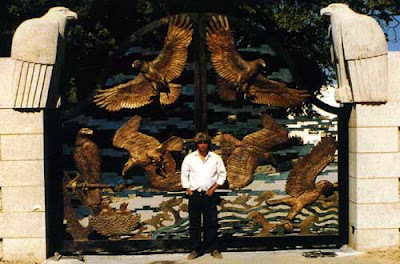 Above: Guy Portelli with his Eagle Gates in bronze, metal and stone. 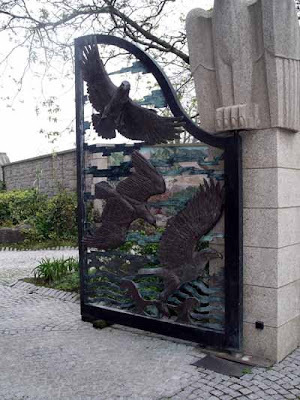 ""The gates weigh around 2 tons worth of bronze, and are possibly the largest set of gates privately owned"
Jude Calvert-Toulmin: How long did it take you to make your wondrous and magestic Eagle Gates, from mental construction to finished piece? 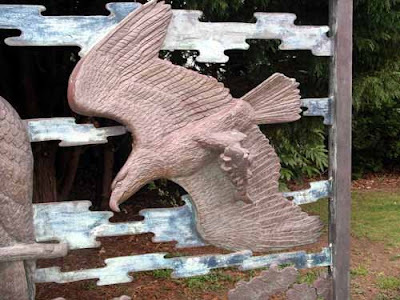 Guy Portelli: Approximately 18 months - 2 months were spent researching eagles' anatomy and how they moved before starting the gates. Jude Calvert-Toulmin: What material would you like to work with that so far you haven't worked with? 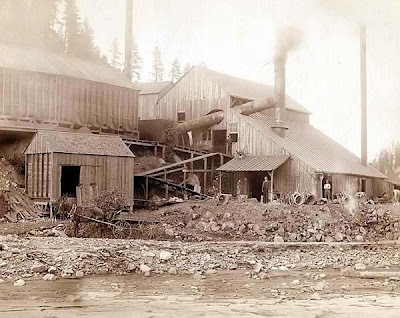 Deadwood and Delaware Smelter at Deadwood, Dakota Territory. Taken by legendary Western Frontier photographer John C. H Grabill, 1890. Grabill donated 188 photographs to the Library of Congress between 1887 and 1892. 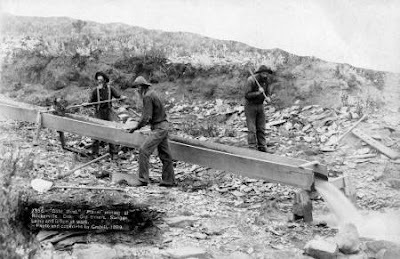 Placer mining at Rockerville, Dakota. Old timers, Spriggs, Lamb and Dillon at work. 1889. Part of the John C H Grabill Collection. 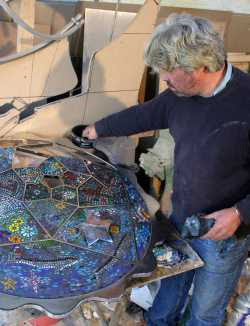 Jude Calvert-Toulmin: The mosaic artist Martin Cheek is often hailed as one of the leading mosaic artists in the UK, and has been a huge influence on my own mosaic work. 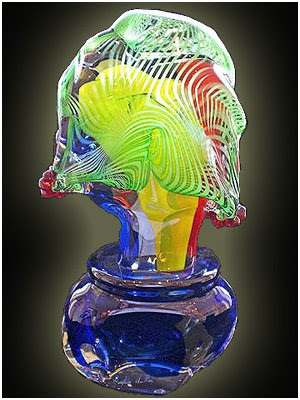 Are you familiar with his work and what do you think of it? He has recently been expanding his working method using fused glass as key feature pieces in smaller mosaics, I wondered what you think of this new work? 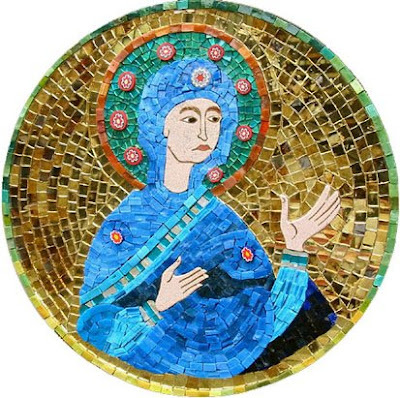 Guy Portelli: Thank you for introducing me to his work - I think the Byzantine pieces are the ones I feel suits his style best - I think what he does is more difficult than what I do! Jude Calvert-Toulmin: Is glass a material with which you'd like to experiment more in the future? 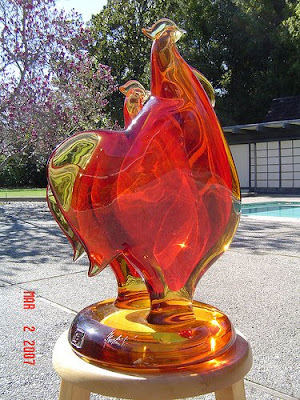 Guy Portelli: Yes, I have done a few small pieces with glass in the past but would like to do more. Jude Calvert-Toulmin: What are you most looking forward to about your upcoming show at the Mall Galleries? Guy Portelli: Getting it all finished, dressing the gallery. Jude Calvert-Toulmin: And what aspect is the most daunting? Guy Portelli: Talking to lots of people! Below, the Pop Icons exhibition as reported by the BBC.